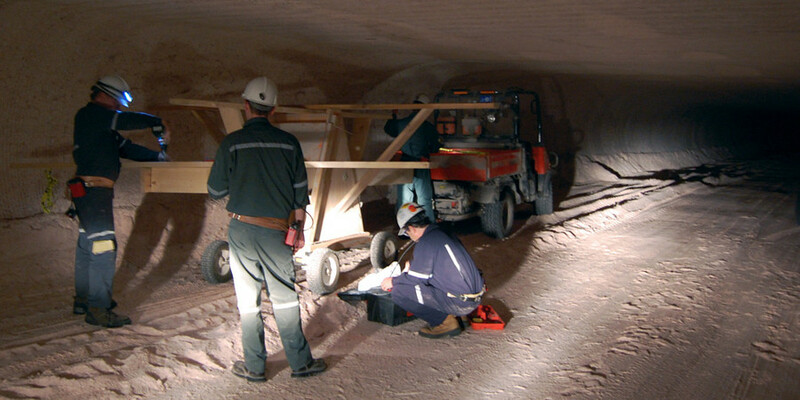 Utmost safety when working underground requires that the formation of cracks and separations in the mine ceiling (ridges) are recognised at an early stage and can be observed closely. For this field of application, RST developed and has successfully tested a special measuring device for a period of two years: With a success rate of almost one hundred per cent, PRIS (Potash Roof Inspection System) uses GPR radar technology in order to precisely map the type and number of cracks. Due to the extremely high resolution of the PRIS system, even Cracks can be detected which are really close to the surface. The early detection of the first warning signals allows to implement the necessary safety measures just in time. The measuring device works without touching the rock surface. Collecting the required data thus is considerably accelerated. During the measuring process, PRIS is installed on a trolley which enables the system to scan the ridges evenly at a speed of 5km/h.